I know some solar fans still exist out there - while I am a fan of the "theme" over the long run, it is hard to get too cheery about specific companies since there is so much competition. [Jan 3, 2008: The Long Term in Solar] But this is one of the favorite sectors for speculators to run in when they need a tried and true group of stocks to run. I see today the Chinese solar stocks are doing their thing... by their thing I mean lose investors money 320 of 365 days a year, but then have moonshots up the other 45 days. I suspect this action is based on this analyst call for First Solar (FSLR)... if you are not that familiar with solar this will sound like gobbligook but most of the major (and medium) sized players have technology based on polysilicon... (same idea as your computer chips). The prices in the polysilicon supply chain have been an rollercoaster causing pressure of extreme proportion to the 90%+ of public players who are on that side of the technology divide. First Solar's process has nothing to do with polysilicon and thus has been shielded from these issues. The polysilicon bull case is eventually a glut will happen and supply/demand will come into better balance - hence cost of goods can drop through the floor allowing some serious price wars. With that said, the potential exists for many smaller to medium sized player in the polysilicon space to also die in this war - hence why this sector is very difficult to invest if you care about intermediate to long term fundamentals. Solar itself should grow quite well over time, but how much thriving can be done at an individual company level will be the question. But that's how people like me think.. .let me break it down how the market in its collective wisdom thinks. Oil up = me like solar stocks. Buy Buy Buy. And that pretty much sums it up.... remember stock jocks like simplicity. Granularity is for nerds. Let's see what FBR Capital had to say about First Solar (FSLR) and in full disclosure this has been the same issue that has been going on for 2+ years now, and each time First Solar just keeps on ticking. I've been on the wrong side of that arguement many times myself thinking "how can First Solar keep this out performance up?" In fact I have a limit buy order down there at that gap near $160 in case we get back there. First Solar has been far and away the best company in terms of operations out of the entire group - but as stated above, they have been shielded from SOME of the storm in the solar space the past 18 months since their polysilcion exposure is nil. p.s. for any long time solar investors who happen to read you will be amazed at how low polysilicon has dropped. We once say levels 6x+ as high not 2 years ago. 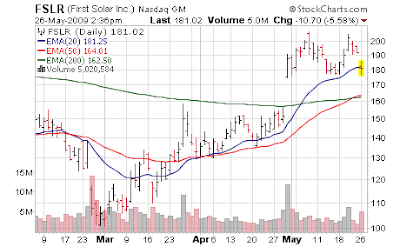 FBR Capital is out with a stingy call on First Solar (NASDAQ:FSLR) downgrading their rating to Underperform from Market Perfrom ($100 tgt). Polysilicon prices taking a nose dive. Checks over the past week suggest (quality) spot poly prices have declined to $65/kg, down 35% year to date, driven by: 1) weak end-market demand for si-based modules, and 2) an aggressive attempt by industry leaders like Hemlock, MEMC, and Wacker (all enjoying average fully loaded cost of $40/kg) to further increase their lead over the new entrants (which are estimated to have $80-plus/kg cost structure). From inexpensive but “quality” poly to inexpensive but “quality” si-based modules. Checks also suggest six inch solar wafer prices (in the spot market) have declined to US$3.50/piece, implying that finished solar wafers are now <>. Assuming US$0.80/watt for turning wafers into modules, we estimate $65/kg poly to yield modules at a cost of US$1.60-US$1.80/watt. And even a rather aggressive GM of 20% implies si-based manufacturers could sell modules at US$2.10 (or EUR€1.62, assuming 1.3 F/X) and compete head-to-head with FSLR. Recent checks indicate at least one of FSLR top customers has already switched from FSLR to a si-based module vendor for a project that is currently under construction. Given the increased downside risk, as well as the current valuation premium given to FSLR, FBR Capital believes the stock will face a significant headwind over the next several months. With the U.S. market not taking off until sometime in CY10 in their opinion, with the PV demand in Europe (and Germany in particular) not improving as fast, and si-based module/system ASPs now offering attractive economic benefits, they believe FSLR will either end up owning more projects (as a means to better control its destiny, which should also complicate revenue recognition) or/and continue to accommodate the market by reducing ASPs well below what is dialed into the consensus.